Hoo-rag loves to be involved whether it’s with brand awareness, fun events or giving back to a local community. Today we wanted to share with you some ways great businesses and events are letting Hoo-rag work for them. Almost everyone is familiar with 5 Hour Energy. When we heard that they wanted to give out some Hoo-rags at the upcoming X Games we immediately jumped on board. In perfect sync with their product, 5 Hour designed a high energy Hoo-rag in popping colors on a black background. Makes us want to be part of the events so we can snag one! Ting Irie claims to be Dubai’s first Jamaican restaurant. Everything about them, including their Hoo-rag design, burns with the spirit of the Jamaicans. We got caught up in the great photos they feature on their social media and started dreaming of the day we can visit them. They even put together a great Hoo-rag video. Go check them out on YouTube and show them some love. The Northern Cancer Foundation kicks off another event this year on March 5th to raise funds and stride toward making more of a difference in cancer outcomes. Each participant will walk (or snowshoe away) with a custom designed Hoo-rag to help keep them warm during their trek. Captains For Clean Water is a non-profit organization that is made up of responsible guides, captains, and civilians that are seeking a long-term solution for Okeechobee water diversion. This active organization is fighting the good fight and looking for donors that realize the damage this nutrient-laden water is inflicting on our saltwater estuaries on the east and west coasts of Florida. 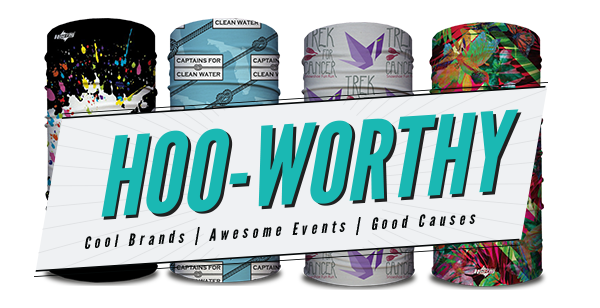 Captains for Clean Water is currently offering a free Hoo-rag to every new member. The Florida Keys Fishing Guides Association hosted a Swamp Guide Ball on February 3rd and 4th. Their goal is twofold: Raise funds to help other Florida guides in times of need, injury or hardship and to work toward helping maintain balance in Florida waters. Hoo-rag was pleased to work with the FKFGA in creating a custom designed Hoo-rag that went out to every participant that received a Captain’s bag. Finally, Hoo-rag is thrilled to be a part of the Marine Industries Associations’ 40th Anniversary Waterway Cleanup. Each participating boat will receive a Captain’s Bag that will have a custom designed Hoo-rag inside. The event happens March 4th in Fort Lauderdale, Florida, and everyone interested is encouraged to get involved (and get a Hoo-rag)! We hope these examples have inspired you on how you can get a custom designed Hoo-rag bandana to work for your organization, event or cause! Interested in knowing more? Call us at 888.831.9344 or drop us a note. *Hoo-rag does not sell our clients custom designs and you will not be able to purchase these products from our website. Interested in getting one? Contact the company or attend their events! Previous post: Whip it Wednesdays: How to tie a Redfish fly.